5. Using evidence and feedback to move learning forward by adjusting learning strategies, goals or next instructional steps. 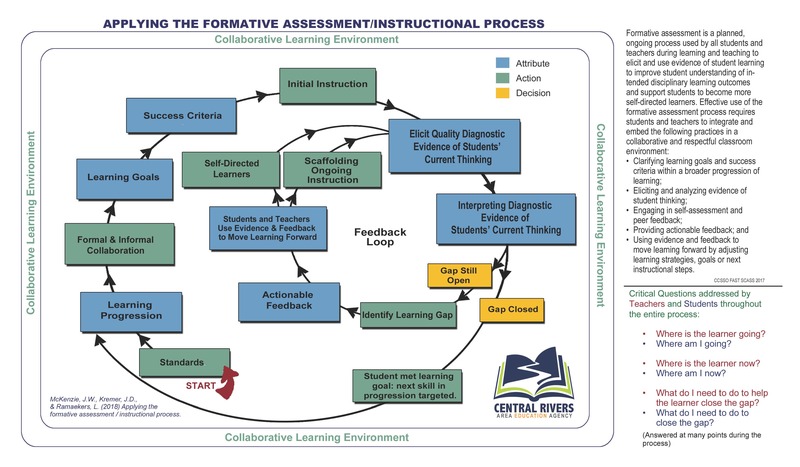 Formative assessment is a process used by students and teachers as part of instruction that provides evidence and actionable feedback to move learning forward by (1) adjusting learning strategies, (2) adjusting goals, and/or adjusting instructional next steps to improve students’ understanding of intended disciplinary learning outcomes. There is a series of modules for use by locally facilitated collaborative learning teams. They have been developed to deepen teachers’ understanding of the attributes of the formative assessment/instructional process. Each module contains a facilitator’s guide to help the local facilitator organize and structure interaction with the content. Buildings or schools are highly encouraged to start with the Assessment for Learning Foundations module. Plickers is a powerful, but simple tool that lets teachers collect real-time formative assessment data without the need for student devices.